Vintage Snowmobiles Are Making a Comeback in Potter County! The Potter County Snowmobile Club is announcing a new winter event - the first annual “Potter County Vintage Snow Fest.” The weekend will feature all things vintage, including Vintage Sled Displays and a Vintage Ride on Sunday. The highlight will be Saturday’s competitive snow track races around the club’s quarter mile oval snow-track. 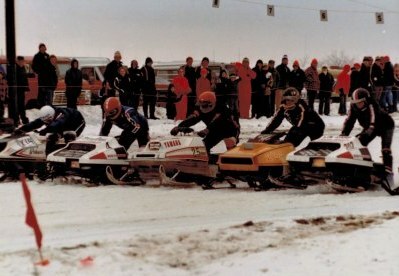 Snowmobiles built in 1983 or earlier are considered vintage. There will be 16 race classes, including a “mini” class for children ages 5 to 10 years old. Entry is $25 per snowmobile. For those enthusiasts who own vintage snowmobiles, but do not wish to race them, there will be an opportunity to display them under a full tent, out of the elements. Join other collectors and enthusiasts in the display tent, most who have restored or maintained their vintage snowmobiles by hand. There is a cost of $5 for display snowmobiles to help cover the cost of the tent. Friday evening, the event kicks off with a groomed trail ride at 7:00 pm and hot dogs at the club after the ride. All riders and sleds are welcome to take a night ride on freshly groomed trails, then enjoy a friendly get together back at the club, where club members will serve hot dogs and beverages for $5. There will also be pre-registration for Saturday’s race from 5:30 pm to 9:30 pm. The weekend will be capped off with a vintage trail ride on Sunday morning. The ride will leave from the clubhouse. There is no charge to ride. The club’s kitchen will be open all weekend serving up hot food and beverages. Visit the club website at www.pcscriders.com for more information. UPDATED DATES - DUE TO A FORECASTED LACK OF SNOW, THE FIRST ANNUAL POTTER COUNTY VINTAGE SNOW FEST HAS BEEN RESCHEDULED FOR FEBRUARY 3 - 5, 2012. THE EVENT IS TAKING PLACE JANUARY 13 - 15, 2012.